Valerian has a relaxing effect on the nervous system, promotes relaxation in individuals leading a hectic lifestyle, and helps support restful sleep. 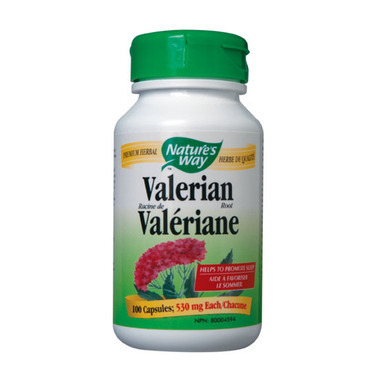 Nature's Way Valerian is guaranteed to contain 0.1% Valerenic Acids. Directions: Adults: Take two capsules once per day with water one half hour to one hour before bedtime. Other Ingredients: Gelatin (capsule), cellulose, magnesium stearate, water. Warning: Consult a health care practitioner if sleeplessness persists continuously for more than 3 weeks (chronic insomnia), or if symptoms persist or worsen. Consumption with alcohol, other drugs or natural health products with sedative properties is not recommended. Exercise caution if operating heavy machinery or driving a motor vehicle within two hours of consumption. Consult a health care practitioner prior to use if you are pregnant or breastfeeding.